I heard that if you follow Outhouse, they do your orders first. Proceeds From Our Austin Live Music Guitar Benefit Musicians In Need. Austin is the "Live Music Capital of the World," yet many professional working musicians are self-employed and rarely have access to health insurance. Without insurance, they can't afford preventive health care, including primary medical care, basic dental services and mental health counseling. The mission of the Health Alliance for Austin Musicians is to provide access to affordable health care for Austin's low income, uninsured musicians, focusing on prevention and wellness. Back in March of 2011, we joined forces with local live music venues to create a souvenir t-shirt design with a commitment that 50% of all proceeds would benefit HAAM. Since it's introduction, the design has been a huge success. We're proud to announce that Outhouse has contributed over $7,000 to HAAM so far! That's a really great start considering the tees have only been available for 9 months. Please show your support in keeping music in Austin alive and well. 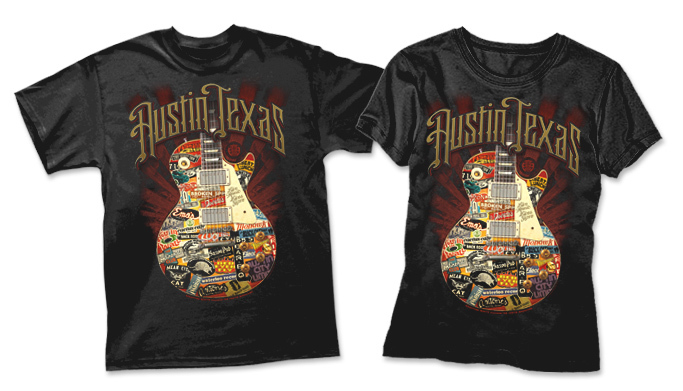 You can find our Austin Live Music Guitar tee available for purchase in our online store, or at several retailers around town. Offered on both men's and ladies' garments. HAAM + Outhouse Designs = Keeping Austin Music Alive and Well-Dressed. I bought one of these shirts and it looks awesome!